How do you like your pasta — molto al dente (slightly undercooked)? Well, at over 75 hours, this rendition of the famous “Spaghetti Nebula” is anything but (undercooked). The Spaghetti Nebula is formally known as Simeis 147, a dim supernova remnant in Taurus. It is a large object, spanning about 3 degrees, and is estimated to be 3000 light years away. 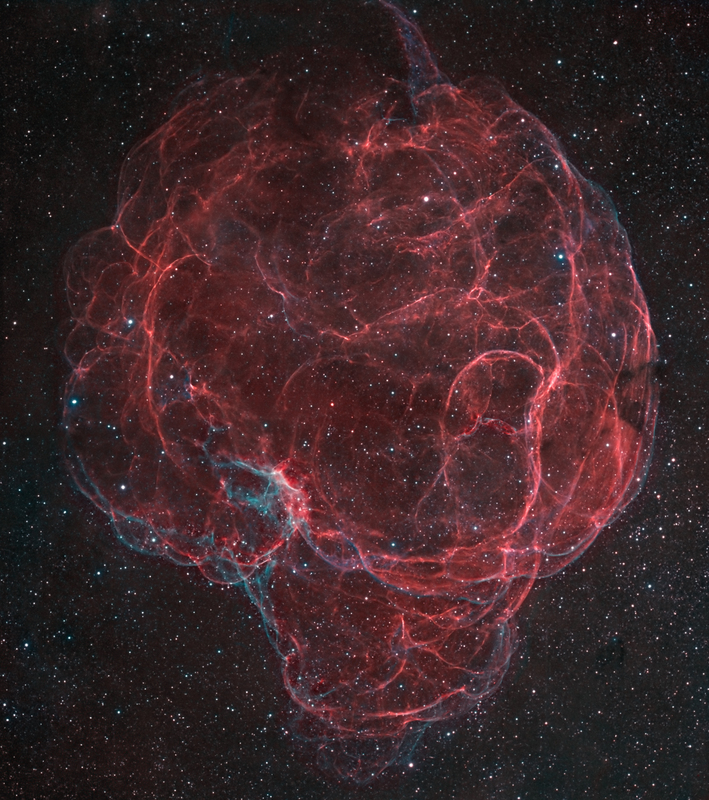 Most renditions of Simeis 147 show only the red spaghetti strands, consisting of the predominant hydrogen alpha emission, but this version also shows the much smaller (teal) OIII component. All data was acquired at MYHY Observatory in the Philadelphia suburbs. This is a 2 frame mosaic using the SBIG STL 11k with the RGH/OAG and Astrodon 3 nm Ha and OIII filters, Takahashi FSQ 106, and Paramount ME. All subexposures were 30 minutes. Processing was as an Ha-OIII-OIII in Photoshop.